Forgotton Anne has no right to look as good as it does. From the amazing backdrops to the character design and even animation, this game is a stunning piece of art. The world looks hand-drawn and screenshots almost look like movie frames. Obviously, the camera angles and level design give the game away, but even so Forgotten Anne is spectacular to look at. Unfortunately, despite its visual appeal, this game made me curse it in frustration more than once. Forgotton Anne is a 2.5D puzzle platformer that has some painful missteps through its six-hour adventure. You play as Anne, forgotten in our world but infamous in her own. She is the Enforcer for the ruler of the world of forgotten things. This world is populated by Items that arrive full of life and personality, while her and Master Bonku are the two humans. Wandering the world is a wonderful stroll through someone’s imagination as you see how objects give life move and interact with each other. A Magnum walks by bouncing on its clip, a bookshelf shuffles its pages into a face, and many other items adorn clothes and rags to give themselves a glimmer of humanity. The world on the surface feels like something lovingly crafted by Disney or Studio Ghibli, but the stories progression, tone and themes meander unconvincingly. Characters and motives are introduced as changed with abandon, which betrays the weight of the relationship the game tries to press on the player. One character, introduced in the final stages of the game offers a seemingly important choice. But without any time to get to know or care about them beforehand, the decision feels hallow and meaningless. What begins as a magical, fantastic journey does make some interesting points, but the theme jumps from abandonment to political commentary to what it means to be human and back again so rapidly there’s a real chance of getting philosophical whiplash. Perhaps it would be more forgivable if the gameplay didn’t feel so stilted. 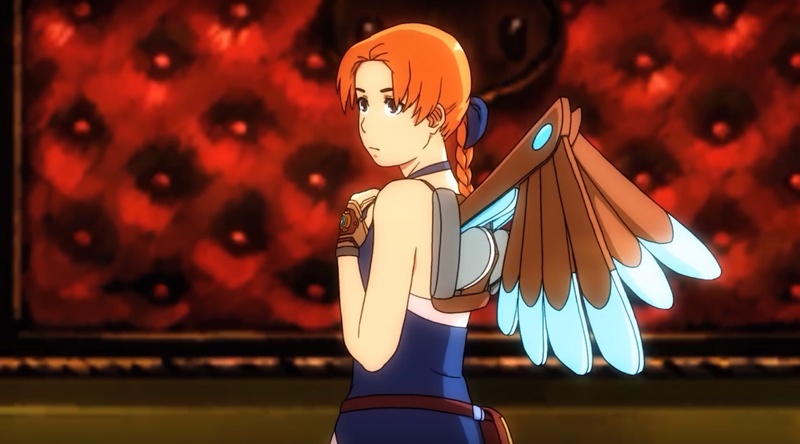 And speaking of wandering, moving around in Forgotton Anne is much more annoying than it should be. Anne has a tendency to do her own thing. Whether that is jumping, climbing or even walking sometimes, the controls just don’t feel very precise. Luckily, there’s no fall damage or any real fail state in Forgotten Anne, unluckily it does mean you’ll probably have to repeat some sections a couple of times. Again, it isn’t helped by the games difficult to read layout. Some sections even have you traveling with a companion, who will occasionally lead the way and occasionally disappear so you can never feel very comfortable following them. The fundamental problem with the game is how it communicates with the play. Whether it where to go, how to get there, or what to do when you actually get there, something is lacking. Well, I love a game that doesn’t hold my hand, you have to be very careful in how you present the game in this fashion. There is no real sense of accomplishment in Forgotten Anne as you progress, nothing that can offset the frustration at walking in circles. And it just makes the whole game disappointing. I wanted to fall in love with the characters and story, but having to negotiate every step of the way made it impossible. The story is actually quite interesting despite its faults but goes completely off the rails at the beginning of Act 3. Before then though, in the city streets, I think I found what Forgotton Anne wanted to be. I explored the beautiful landscape at my own pace, taking my time and getting to know the space, but all the while knowing where I was going. The puzzles broke up the exploration and there was a huge collection of characters to meet along the way. But soon after this section was forgotten. It was a small highlight in a realm of forgettable, annoying instances that don’t live up the environments they inhabit.